SBCC Patterns are designed for the woman who is short in stature but not in attitude and are sized 00-28W. These patterns can be easily un-petited and details on how are available on the website. 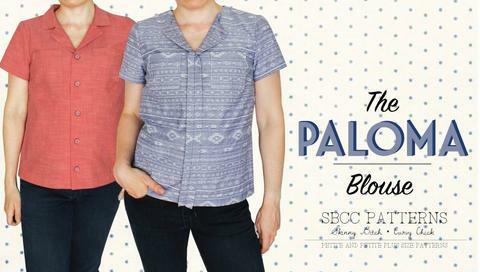 SBCC patterns are designed for an intermediate/advanced sewist but if you're a patient beginner, you will find that they sew together easily. There are 20 patterns on the website ranging from t-shirts, to a hoodie and yoga pants, and a dress or two. They are pdf patterns that are sensibly priced. You may have seen The Tonic Tee sewn up around the online sewing universe. My favorite and must thorough review was done by Debbie of Stitches and Seams. You should check out her amazing t-shirt here. There are 45 reviews of the tee on PatternReview. Some other reviews of the Pinot Pant, The Cosmo Skirt and The Mimosa Blouse are also on PR and should be checked out. So now that you've seen a few of the patterns and read some of the reviews, here's the pattern giveaway...any pattern on the SBCC website is available to win. Just leave your name in the comments section along with which pattern you'd like to win! Please choose just one. Since the giveaway is for a pdf pattern, it's open to everyone in the sewing universe. Please make sure that you sign your comment with your name if you are logged into blogger as unknown. No name and your entry will be voided. This giveaway is open until Wednesday, September 14th at 11:59pm EST. The winner will be announced on Saturday, September 17th. This is the last pattern giveaway for the month. I don't know about you but I can't believe how fast that went. Hope you've enjoyed the giveaways and don't forget to leave a comment for this one! Ooh! What a great giveaway! I'd love the Bronx dress. Thank you for doing this Carolyn, you found some great companies for giveaways and succeeded in reminding me of things I want to sew from their stables. Thank you Carolyn. I like very much the Brooklyn hoodie. I really like the Cabernet Cardigan. Thanks for the opportunity! The Manhattan Trousers look fabulous. I've been struggling with trouser-making for a little while and it might be nice to try a pattern that I don't have to automatically adjust for my petite body! I'd love to get my hands on the Moto Chic jacket. Foor me it would be the Brooklyn Hoodie!Thank you for the offer! I am *such* a SBCC fangirl! The Tonic 1 fit so great right out of the envelop, I couldn't believe it! I'm a supporter and advocate for niche market sewing patterns like SBCC for Petites, Cashmerette for Plus Sizes, and Sewaholic for Pear shapes. I am torn between the Thai dress and the Moto Chic. Can't wait for Betsy to release the jacket pattern that was delayed due to a computer crash. If she puts out a pencil skirt, I don't know what I'll do with my self, LOL! Thank you for the give away. My name is Jannie Jørgensen and I would like to win the gibson blouse. I ♡ the Tai dress - just my kind of style! I would love the Limoncello Cardigan! Thanks to SBCC and you for this fund Sewing Month event. I'd love to try the Moto chic jacket! With cold weather coming, I think the Tonic 2 is just what I need. It was hard to pick just one, though! I love the Tai dress. Very nice design. I would be intersted in sewing up the Brooklyn hoodie. Thanks for hosting this give away! The Collins blouse looks lovely. Thanks for the opportunity! The Brooklyn Hoodie would be a great opportunity to create a quality staple for myself. I love the Mimosa blouse. Thank you for introducing me to yet another great pattern company! I would love to try the pants. Thanks for making this opportunity possible. I'd love the Brooklyn hoodie. I love the Brooklyn Hoodie. :) Thanks so much for all the prizes. The Moto Chic jacket caught my eye! Thank you! Oh, boy...it's a toss up between the cabernet cardi and the lemon drop dress. Sue Givens and I like the Brooklyn hoodie! Thank you so much for the opportunity - put me down for the Bronx dress, please! I can see Paloma lengthened to a tunic with a slightly longer back....perfect for me. I need the Brooklyn hoodie! I really like the longer length. Love those patterns! Would make a cardigan or the Brooklyn hoodie. Hoping for the Bronx dress! Love the Gimlet hack on the SBCC blog. I hope that I didn't post multiple times- please delete any other duplicates. . . or triplicates! what a choice ... but I'm really drawn to the Mimosa! I think the Julip skirt is interesting. I have not tried these patterns. I love the Cabernet cardigan. I'd love to try out the Moto Chic Jacket. Thanks for this opportunity. I have the perfect fabric for the Mimosa blouse! Thanks for the chance to win! I like the CABERNET CARDIGAN. It would help fill out my work wardrobe in my cold office. I like the Gibson Blouse. I'd like the Brooklyn Hoodie. Thanks for doing all these great giveaways! Ooh! That Moto Chic Jacket! Love the Carbernet Cardi! Would live in that year round made in a substantial interlock for winter and a lighter weight knit for summer. I like the tonic tee! I've never heard of these patterns before which is surprising because I am petite. Thanks for the giveaway. I have been watching the Paloma top and the Tai dress for quite a while. Thank you for highlighting some indie patterns. I like the Brooklyn Hoodie. Thank you for setting up these fun giveaways! I love the Brooklyn Hoodie. Thank you! I love the Manhattan trousers! Thank you for introducing me to a new pattern line. I like the Paloma Blouse. the tonic tee. thank you! Love the Mimosa blouse. Thanks for the chance! I'd like to try the moto chic jacket. Thanks for the giveaway. I've been wanting to make a hoodie. This looks like a great one. The Julep skirt caught my eye! Thank you for the giveaway! Hi! I love your blog! I wanted to comment that I'm so happy seeing the SBCC patterns being given some recognition. I haven't seen that much on other blogs. I too have made about 5 Tonic Tees. It is my 'go to' pattern. I've also made the Manhattan trouser with some adjustments in the crotch. The patterns are easy to follow. Ads a pretty new sewist, I've sought the help for the company a couple of times on a few things and they have been extremely helpful and responsive. So hard to choose! I think the trousers would be great but the moto jacket sounds awesome too. Thanks for the giveaways! 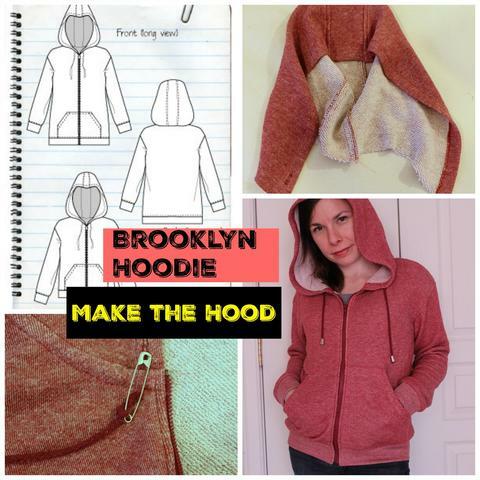 The Brooklyn Hoodie would make great addition to my fall and winter wardrobe. Thanks for introducing et SBCC patterns. How nice to find accompany that believes that women of all sizes should have access to fashion that fits. I'd love to make the Manhattan trousers for work! Thanks for the giveaway! 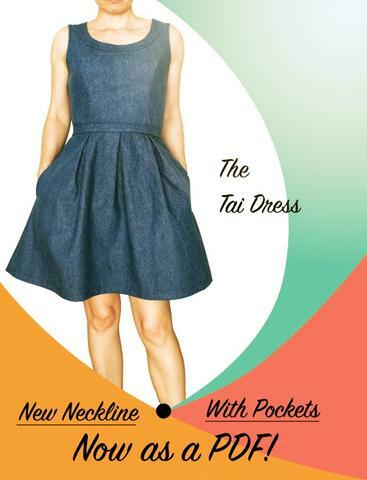 I would llove a copy of the Tai dress - it is gorgeous! Oh, I'd love to win the Moto Chic Jacket. The Mimosa looks like a fun blouse. Thank you for the giveaway. I would love to win the Cabernet Cardigan! It is so hard to choose! I'd love to win the Moto Chic jacket pattern! I've had my eye on the Cabernet Cardi for a long time. Pick me pick me! If I were lucky enough to be chosen, I'd pick the Brooklyn Hoodie. If I was a lucky winner I would get the Moto Chic Jacket. Awesome giveaway! This is tough. So many great options. I have never made pants and Pinot pants looks like a great starter. The Tonic Tee 2 is my choice, size XL1. I have my fingers crossed!